Social Science History advances the study of the past, publishing peer-reviewed original articles that combine empirical research with theoretical work, undertake comparisons across time and distance, or contribute to the development of quantitative or qualitative methods of analysis. 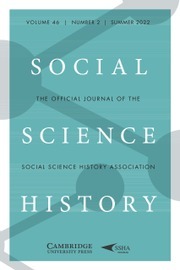 The interdisciplinary research community of social scientists -- historians, sociologists, economists, political scientists, anthropologists, and geographers -- that form the membership of the Social Science History Association and its research networks benefit from the high-quality articles provided by the journal. Rallying around the President: When and Why Do Americans Close Ranks behind Their Presidents during International Crisis and War?